Chordelia Guitar Machines are made one at a time in our tiny workshop in West Cork, Ireland. We'd like to sell them for less money but it takes a long long time to make each one. We think, when you see and use one, you'll think they're well worth the price. The C5m has the same chords, except the A and the E are minor chords. The C6 has Am C, D, Em, F and G chords. Not sure which one you want? Look up a couple of your favourite songs and go from there.. They cost 225 USD + shipping. Total cost is $250, which includes registered postage and packing to anywhere in the world. To order one, just click on the PayPal button and you will be taken to your PayPal account. 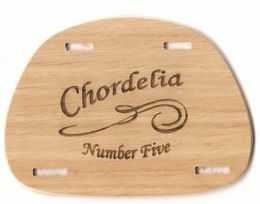 Click the button to buy one..
Chordelia Number Six is now available too! The cost is 280 euro, plus 25 euro shipping worldwide (around 350 USD). Just click the Paypal button below..
How a Chordelia is put together..